Edith Abbott (September 26, 1876 – July 28, 1957), older sister to Grace Abbott, both of Grand Island, Nebraska, began her career as a school teacher, but became an esteemed social worker, author, legislative advisor, and the first woman to serve as dean of an American university-based graduate school. A leader in the establishment and development of organized social work, Edith Abbott’s enduring contributions span the fields of education, economics, and politics. Determined to correct the most extreme of the nation’s problems, Abbott’s success is often credited to her atypical upbringing, which instilled in her the ideals of social justice for all people. Edith Abbott was born into a family that believed in the ideals of justice, women’s equality, and political activism. Her parents had moved to the western plains and embodied the pioneer spirit. Her father, Othman, was the first lieutenant governor of Nebraska, publicly maintaining a strict anti-slavery platform throughout his time in office. Her mother, Elizabeth, an educated abolitionist and women’s suffrage leader, instilled within her children similar values. Both Edith and her sister would in later years recall their mother's words, "…even if you are little girls, you can be suffragists too because it is right and just" (Costin 2003). Consequently, Edith Abbott’s home life played a large role in her future endeavors. In 1893, Edith graduated from Brownell Hall, a girls’ boarding school located in Omaha, Nebraska. Because her family could not afford to send her to college, she began teaching high school in her hometown of Grand Island. After taking correspondence courses and attending summer sessions, Edith earned a collegiate degree from the University of Nebraska in 1901. Two years later, she enrolled at the University of Chicago, where she would earn a Ph.D. in economics in 1905. Receiving a Carnegie Fellowship in 1906, Edith continued her studies abroad at University College London as well as the London School of Economics. There, she studied with social reformers such as Sidney and Beatrice Webb, before returning a year later to the United States to teach economics at Wellesley College in Massachusetts. One year later, aiming to work more directly with the issue of poverty, Edith relocated to Chicago to join her sister, Grace, at Hull House. While there, the sisters advocated for women’s suffrage, improvements in housing for the poor, and legislation to safeguard immigrants, women, and children. At the age of eighty-one, Edith Abbott eventually succumbed to pneumonia, spending her last years in Grand Island with her brother Arthur. Having never married, she left the bulk of her estate to the Grand Island Public Library and established a trust for a collection of non-fiction books in memory of her mother, Elizabeth. During her time at Hull House, Abbott drew sustenance from the settlement community, living alongside the likes of Jane Addams, Alice Hamilton, and Mary Kenney O'Sullivan (Hymowitz and Weissman 1978). At this time, Abbott also worked as an assistant to Sophonisba Breckinridge, then director of social research at the Chicago School of Civics and Philanthropy. Abbott’s contributions included studies on juvenile delinquency, truancy, women in industry, and problems in the penal system. In 1920, Abbott and Breckinridge helped to arrange the transfer of the School of Civics and Philanthropy to the University of Chicago, where it was renamed the School of Social Service Administration. Abbott was determined that education for social work be at the graduate level, connected to a university, but treated as a professional discipline separate from the social sciences. Successful in establishing such a school, Abbott served as dean of this first university-based graduate school of social work. During her tenure as dean, from 1924 until 1942, she developed a curriculum for social work education that consistently emphasized the value of a formal education together with the importance of field experience. In 1926, Abbott helped to establish a Bureau of Public Welfare within Cook County, Illinois, while co-founding the Social Service Review with Breckinridge one year later. Abbott would later teach and edit this review, an examination of social welfare policies, until 1953. Arguably Abbott’s most recognizable contribution to the history of the United States came in 1935 when she helped to draft the still-standing Social Security Act. In later years, Abbott was acknowledged as a confidant and special consultant to Harry Hopkins, a chief adviser to President Franklin D. Roosevelt throughout such historic events as the Great Depression and World War II. Throughout her career, Abbott wrote more than 100 books and articles on a variety of topics, earning her the nickname "the passionate statistician." In her writings, Abbott stressed the responsibility of the state to address social inequalities, the need for public welfare administration, and the desire for an equitable reform of the social welfare system. Before 1924, a majority of United States welfare systems were controlled and funded on a strictly private basis. Less than thirty years later, upon her retirement in 1942, Edith Abbott had successfully established a public social service agency that provided a more centralized structure, grounded in a solid program for educating professional social workers. A true pioneer in the struggle for social justice, Edith Abbott's legacy continues to contribute to the progress and advance of the United States system of social services. Abbott, Edith. 1911. Finding Employment for Children who leave the Grade Schools to go to Work: Report to the Chicago Women's Club. Chicago: Manz Engraving Co., Hollister Press. Abbott, Edith, and Sophonisba P. Breckenridge. 1906. Employment of Women in Industries: Twelfth Census Statistics. Chicago: Chicago Women's Trade Union League. Edith Abbott University of Chicago, School of Social Service Administration. Edith Abbott (1876-1957) NASW Foundation. 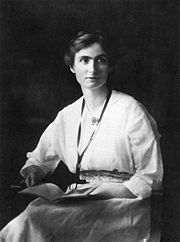 Edith Abbott (1876-1957) - Social Reformer, Author, Administrator and Educator by John Sorensen, Founding Director of the Abbott Sisters Project. Edith Abbott (1876–1957) Women Working, 1800-1930 - Harvard University Library, Open Collections Program. This page was last modified on 25 September 2017, at 19:51.